The cascade of CS stage and CG stage is called as the cascode amplifier. 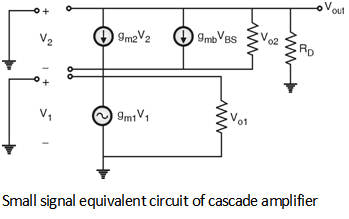 Figure below shows the cascode amplifier circuit in which CS stage and CG stage cascaded. In cascode amplifier the output of CS amplifier is connected to the input of CG amplifier. Figure below shows the small signal equivalent circuit of the cascade amplifier. From this we can observe that the cascade topology improves the gain of the amplifier. This is mainly because the small input signal is first amplified by CS stage and the amplified output signal of CS stage is further amplified by the CG stage. Further the cascade stage also has the high output impedance.